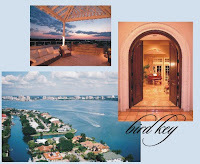 Homes for sale on Bird Key number 52 according to the current Mid Florida Regional MLS idx database. Boating enthusiasts seek homes on Bird Key because of its deep water canals and yacht club community. According to the data the lowest priced home on the Key has been reduced $90,000 and the sellers are now asking $599,000 for this three bedroom, two bath home. Lawns are beautifully manicured, and this quiet Sarasota neighborhood is home to entertainment personalities such as Jerry Springer who have owned Bird Key real estate for many years. To reach Bird Key homes, take a left at the first stop light just over the Ringling Bridge from Sarasota, FL. St. Armands Circle with its world-class shopping is a very short drive from Bird Key. Casual restaurants, fine dining, ice cream shops, beach apparel shops and high-end shopping are all found on the Circle. Shop til you drop and be home in five minutes or take a stroll on Lido Key beach. Bird Key residents can enjoy all Sarasota's amenities and cultural venues just across the John Ringling Bridge from Bird Key. We specializes in all Sarasota FL real estate. Give us a call if you are thinking of buying or selling a home in Sarasota. Make an appointment for our specialized marketing plan if you wish local/global exposure for your Sarasota home.